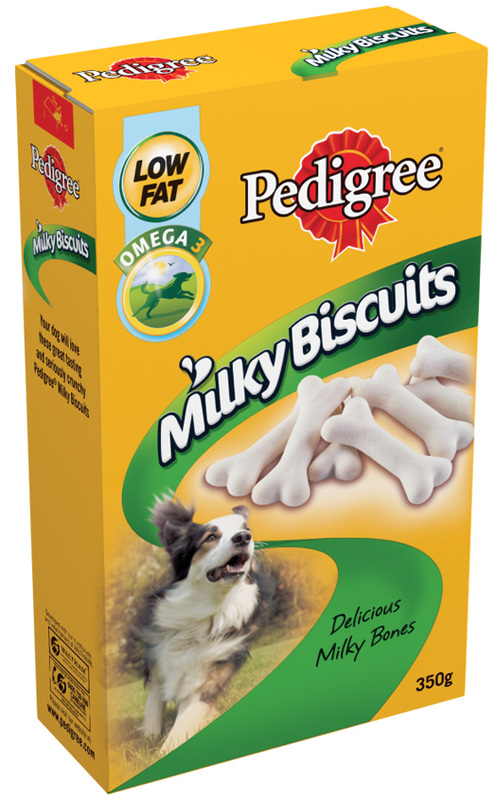 Pedigree Milky Biscuits are delicious, low fat treats that your dog will love. With 96% fat free, these can be used as a training treat or for any occasion, these delicious biscuits will quite literally have your dog eating out of the palm of your hand. Also rich in Calcium and Phosphorous for healthy teeth and bones. Cereals, Minerals, Various Sugars, Oils and Fats, Milk and Milk Derivatives, Meat and Animal Derivatives. The following shows the daily feed amount per day. Make sure your dog has access to fresh water. Below are some recent questions we've received regarding Pedigree Milky Biscuits Dog Treats, including answers from our team. I would certainly not recommend it. There are many things you can feed to rabbits which they will enjoy. A huge number of these things are not very good for them, though you can perhaps get away with small amounts for a while. I would have to say that it is much better to feed rabbits what is good for them. (My kids would love a diet based on Mars Bars but that is not what I feed them.) Rabbits are in fact "designed" to live on a very high fibre, low energy diet. This requires large amounts of chewing and is very slow to digest. They like to eat many other foods, but there teeth and guts suffer over time with the wrong diet. Many rabbits have awful teeth and chronic diarrhoea, which would never have happened on the right foods. I would suggest mostly hay, complete pelleted rabbit food, then treats based on fresh herbs or fresh grass, with the occasional dried rabbit treat perhaps. Rabbits love a bit of fresh coriander or parsley which you can grow easily or buy in the shops. Are these ok for hamsters. Yes they can be fed to hamsters, as some of our customers like to do. You just need to ensure not to give them too many as they do contain various sugars.